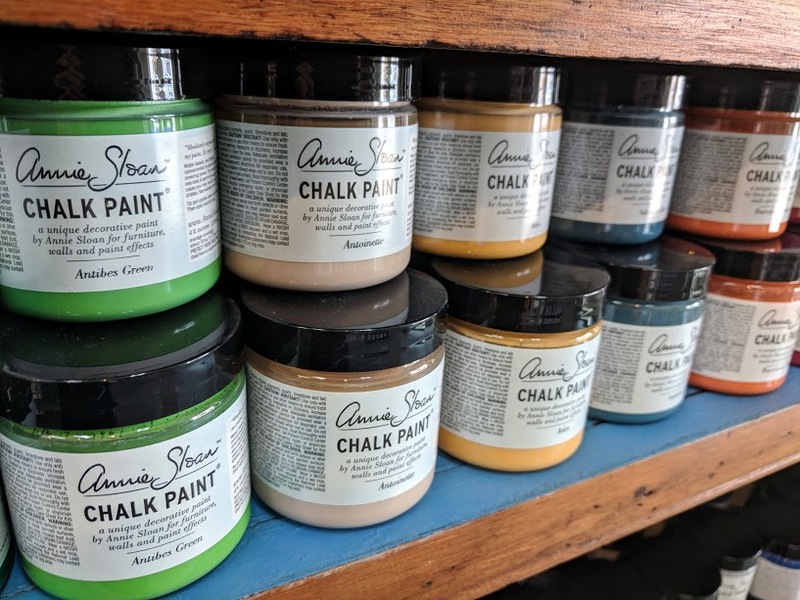 You know by now how we feel about Chalk Paint® by Annie Sloan. We love it! This amazing paint is easy to apply with little to no prep, and lends itself to many techniques not easily used with other paints. 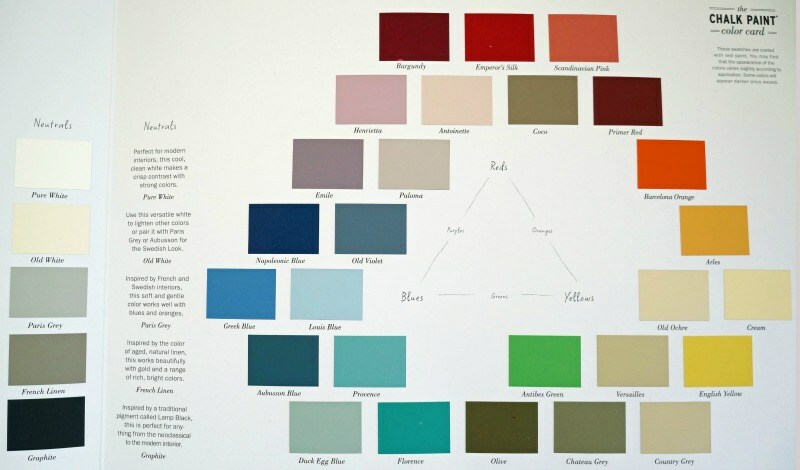 One of the reasons that we love Chalk Paint® is the options in color. There is a color for every occasion. Looking for a mellow off white? Perhaps Cream is the color you are looking for. How about something bold and passionate? Emperor’s Silk might catch your eye. There are a LOT of options! Sometimes, the color combination you’re looking for is a little more nuanced. That’s alright! The paints mix together quite well. The easiest application to this is darkening your paint by mixing it with Graphite, or lightening it by adding Pure White. 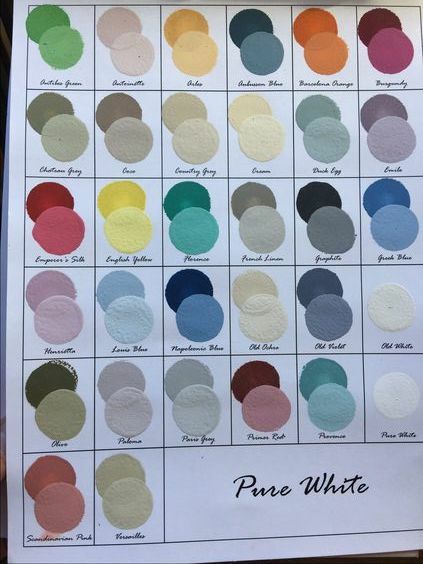 The picture below is all of the available colors, along with the colors mixed at a 1:1 ratio of Pure White. There is so much room for creativity, though. Here's another chart, but this one mixes all the colors at a 1:1 ratio with the beautiful Emperor's Silk. There are a lot of recipes out there to try out, and we thought that we would share a few that we had found. There is a lot of creativity to be found with Chalk Paint®. If color mixing isn't enough, there's always the different types of finishing wax that we carry. While we do have Clear, we also carry Dark, Black, and White. For an idea of how waxes affect the finished product, here is a sample of Clear Wax next to Dark Wax. Interested in learning other techniques? Check out one of our workshops. They're a lot of fun, and incredibly informative. The more you know, the more room you have to be creative. We love to talk about how versatile Chalk Paint® is, yet it’s hard to really know how amazing it is unless you know how to use it. That’s why we have workshops! While there are videos out there on different ways to use the paint (there are quite a lot at the Chalk Paint® website, in fact), there’s nothing like having a walkthrough with a patient teacher. Alex, our store manager, is a fantastic paint teacher. She leads very educational workshops, but more importantly workshops with her are a LOT of fun! The supplies come with the workshop, so it makes it an economical way to explore the world of Chalk Paint®. We have quite the roster of different workshops that happen throughout the year, but there are three that have been mainstays to our schedule. Those three are Introduction to the Annie Sloan Method, Paint Your Own Piece (shortened to PYOP) Workshop, and our Dirty Pour Workshop. It’s those three that we wanted to tell you a little about. The beginners workshop is the Introduction to the Annie Sloan Method Workshop. Even if you have experience with regular paints, this workshop is still incredibly informative. We cover the basics, such as the paints, the brushes, the waxes, and the laquer. We go beyond that in use and technique. We cover Annie Sloan’s signature two-colored distressed finish, as well as strokes and basic distressing techniques. One of the biggest selling points of Chalk Paint® is how little prep work is needed for the piece. In this workshop, we cover the techniques to assure both the easiest process as well as the ways to be most successful in your painting. Once you begin to see all of the potential in Chalk Paint®, you’ll feel the longing to explore this exciting creative avenue. Want to try using the techniques on your own piece, but you don’t feel quite confident enough to get to it without a little guidance? That’s where the Paint Your Own Piece (PYOP) Workshop comes in! The PYOP Workshop gives you space to play with the techniques you learned in the basic class on a small piece of your own. You’ll have a chance to use our paint, brushes, and wax to give a piece a brand new life. It’s amazing what a little paint and wax can do to an old piece that’s been kicking around. It’s a great space to explore, find guidance, and be social. The Dirty Pour Workshop is one of our favorites. Maybe it’s because the technique creates such beautiful patterns. Maybe it’s because it’s so messy. All we know is that the end product speaks for itself! Just look at these pictures of what you can do with these techniques! On May 19th, we had the pleasure of hosting a “Mommy & Me” Workshop for Mother’s Day. Alex was joined by three Mommy/Daughter duos, as well as her own daughter, Maddison. They worked on painting terracotta flower pots, and got to fill them with potting soil and flowers after they dried. It was wonderful seeing how different each student’s project came out; some used handprints, some painted flowers and bright yellow suns, and some (the Littles in particular) channeled their inner Jackson Pollock! Every flower pot turned out beautiful in their own unique way. Laughs, smiles, and of course snacks, were abundant in that workshop and we would love to do it again soon! We hope to see even more people the next time around, and can’t wait to show you all the different ways you can use this amazing paint in (and out) of your home! A few years ago, Karen Matthews, owner of Details Interior Fashion, was introduced to Chalk Paint® by Annie Sloan. She found it to be so amazing she began to research how to be a stockist of Chalk Paint®. Through that research, reDesign was born with the opening at the end of Nov 2016 proudly selling Chalk Paint® and other Annie Sloan products. Annie Sloan, an artist and author from Oxford, England, began her professional painting in the 70s. After finishing The Complete Book of Decorative Paint Techniques, she had difficulty finding a paint that she liked working with. Using her knowledge of color, paint pigments, and art history, she developed Chalk Paint®. Since its beginning in 1990, Chalk Paint® by Annie Sloan has become recognized globally as the Original and the best. At reDesign we offer Annie Sloan’s easy-to-use products, along with books, brushes, stencils and fabrics, and are helping to transform more and more homes every day. Don’t know where to start? 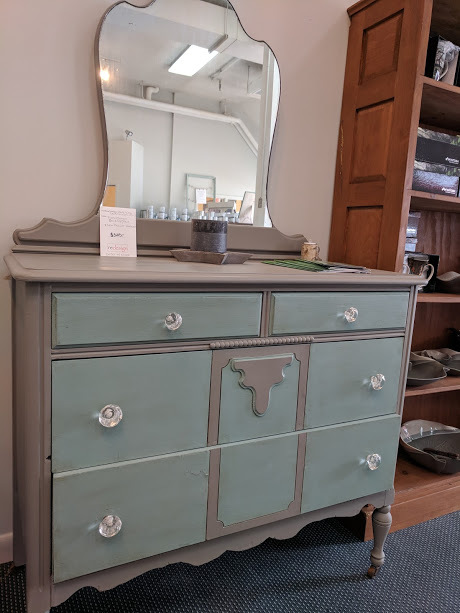 We offer workshops so you can learn how to use Chalk Paint® to get the look you are searching for. You’ll learn how to transform a drab piece of furniture into something eye catching and beautiful. If DIY is not your thing, that’s quite alright. Alexandria, our store manager, would be more than happy to take the project on. She can bring new life to the piece and make it sing with your decor. And custom colors? Can do! Next time you’re in, look around at the chairs, desks, cabinets, and more to see how Alex has used her expertise in color choice and painting. You’re sure to fall in love with one. ReDesign is more than Chalk Paint®, though. We carry Hilborn Pottery from Canada, designed by award winning potter Nancy Macnaughton Hilborn. These pieces are oven and dishwasher safe and their beautiful colors and shapes are a joy to bring to the table. Also look for our china mugs from McIntosh Trading with gorgeous scenes and brightly colored foliage - perfect for the mountains of New England! Stop by sometime. Peruse the selection of paint, painted pieces, pottery, and more. Talk to Alex about how Chalk Paint® . Come experience its magic! But be forewarned… it is addictive!